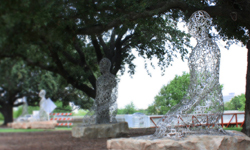 Created by internationally-renowned Spanish sculptor Jaume Plensa, “Tolerance” is a grouping of sculptures sited in Buffalo Bayou Park at the intersection of Allen Parkway and Montrose Boulevard. It was installed in 2011 to coincide with the construction of the Rosemont Bridge, which offers pedestrians and bicyclists a way to cross Buffalo Bayou without entering automobile traffic on Montrose. 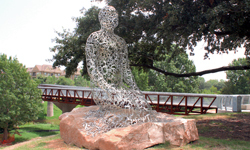 The seven human figures represent the seven continents, and are made of silvery aluminum. Their framework consists of alphabetic symbols from languages around the world, reflecting the artist’s belief that, whatever culture we live in and whichever language we think in, our lives are similar. At night, the sculptures are lit from within. They rest on rough-cut granite pedestals. “Tolerance” was brought about through the efforts of Mica Mosbacher and was overseen by the Houston Arts Alliance. Major funding was achieved through the private sector.